Armidale - Refuge/Prospect, Armidale, by Virginia Wong-See architecture@altitude. Winner of the Award for Small Project Architecture. Photo by Brett Boardman. This year's 2018 NSW Country Architecture Awards featured architecture and architects from across the broader New England. Byron Bay architects Dominic Finlay Jones Architects took out no less than five awards and three commendations. These honours included the award for Residential Architecture – Multiple Housing presented for the Habitat Live Work project, which provides a new building prototype featuring basic, good-quality, lower-cost housing with articulated home-office workspaces and is set within a sustainable development encouraging collective creativity. Kingscliff architects Aspect Architecture’s Elanora House, a flexible beach home suitable for multi-generational living, was crowned winner of the Residential Architecture – Houses (New) category, with the jury noting the project ‘does a number of small but significant things very well’. Armidale's Virginia Wong-See of architecture@altitude took out the Small Project Award and Termimesh Timber Award for her ‘small and perfectly formed’ Armidale – Refuge/Prospect garden pavilion. I really loved this one. 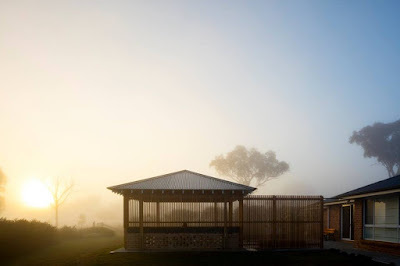 Ms Wong-See describes it in this way: "The concept for Armidale Refuge/Prospect began as a simple place of refuge from strong westerly winds, transforming an ordinary place into one that continues to delight through foggy mornings, moonlit nights, fireside conversations and enjoyment of the surrounding trees and the birds that come to rest there." The Armidale Express story on this particular award provides more details and a broader range of photos. Have a look and you will get a feel for why I really like this is a truly imaginative work. The final award in the program, the People’s Choice Award, was also announced at the Awards presentation night, held at the NSW Regional Architecture Conference on Thursday 4 October. This year the honour went to a project in the newly introduced Interior category: the Byron Shire Council Foyer, Mullumbimby, by Byron Bay architects SPACEstudio. NSW Chapter President, Andrew Nimmo, congratulated all of this year’s award winners and noted the important contribution the profession as a whole was making to deliver more sustainable, cohesive communities. If you would like to see photos of all the ward winners you can find them on the Australian Institute of Architects Facebook page.